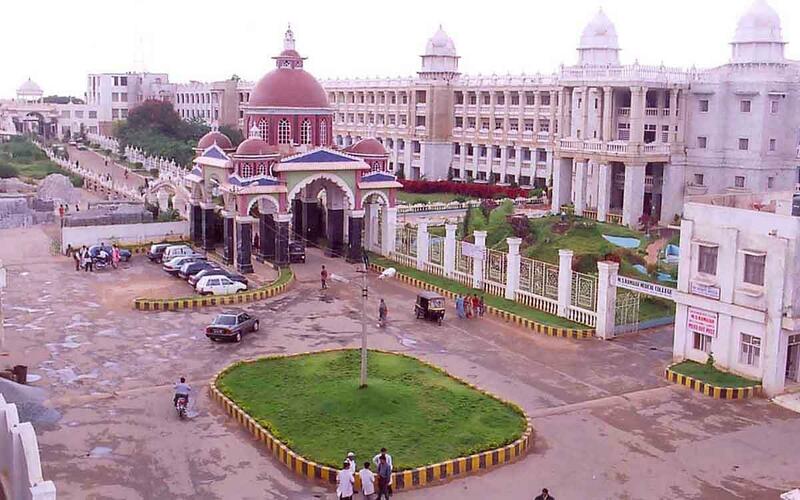 Ramaiah Medical College was set up in the year 1979, in Bangalore, Karnataka. The Institute has gained recognition and repute in India and Abroad. The college is spread across 65 acres of land and houses Ramaiah Dental College, College of Pharmacy, Institute of Physiotherapy and College of Nursing. 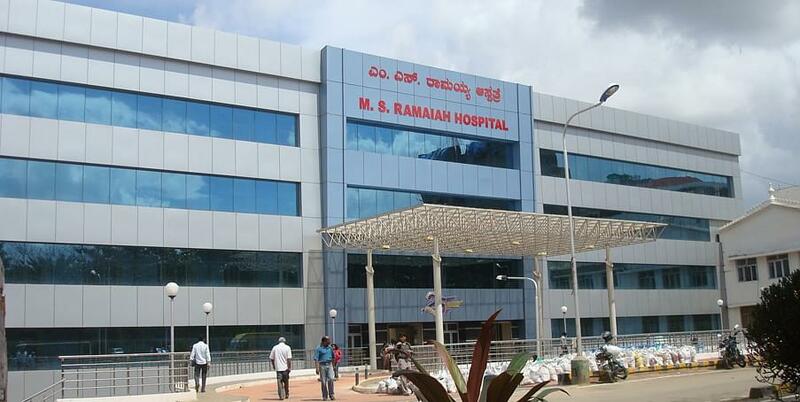 Ramaiah Medical College offers undergraduate, Postgraduate and Ph.D. courses in all Pre, Para, and Clinical disciplines. The Institute also offers Super Specialty courses viz, M.Ch. and DM to the candidates. 30.5 Km from Kempegowda International Airport. 8.6 Km from Bangalore City Railway Station. Pass 10+2 in Physics, Chemistry, and Biology with minimum 45% (BPT) and 50% (MBBS) aggregate marks. Passed MBBS degree from MCI recognized University/ Institute and one-year rotary internship is mandatory. Merit – Marks in BPT degree. Passed MD/ MS degree from a recognized body. Entrance – NEET SS conducted by NBE. The Placement cell of the college centres works round the clock. Companies approach the Institute with vacancies and candidates are provided to these reputed firms after complying fully with their requirements. Placement staffs are committed to provide the best placement solutions to all students. They take up the matter of placing students with corporate firms ardently. The University offers Scholarship facility to all the students. Scholarships are available to support full-time study at the University for Indian nationals only. Each year the University awards several scholarships in the form of fee remission to outstanding candidates. These scholarships of positive inclusive effort vary in value and have different criteria for which they are awarded. Students Tracking System: To ensure regular updates to the parents and guardians regarding the academic progress of their children, a unique and effective system been implemented. The student attendance and performance statistics are regularly monitored and updated on the college website to which the parents can have access using a secure password. Library: The library is maintained well and regularly enriches its collection in order to allow users full access to current research tools and technologies. The library is an active member of ‘HELINET’ consortium offering more than 700 indexed national and international journal. The college management is good at what they're supposed to do. They've ensured that students are all provided with good infrastructure and facilities to excel in their academics. Its really a good college it contains all five years of precious memories which no one can take it away its one of the best decision i took to be apart of M.S. 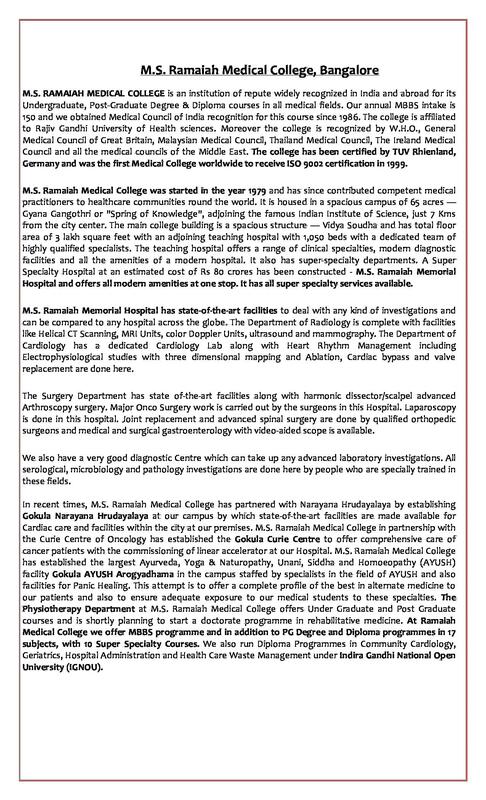 Ramaiah Dental College and Hospital. Hi Anjali, admissio in MBBS is done on the basis of marks scored in NEET UG. Candidate must have passed class 12th with at least 50% having PCB combination to be eligible for the course. You may check the Fee Details of the same from here. 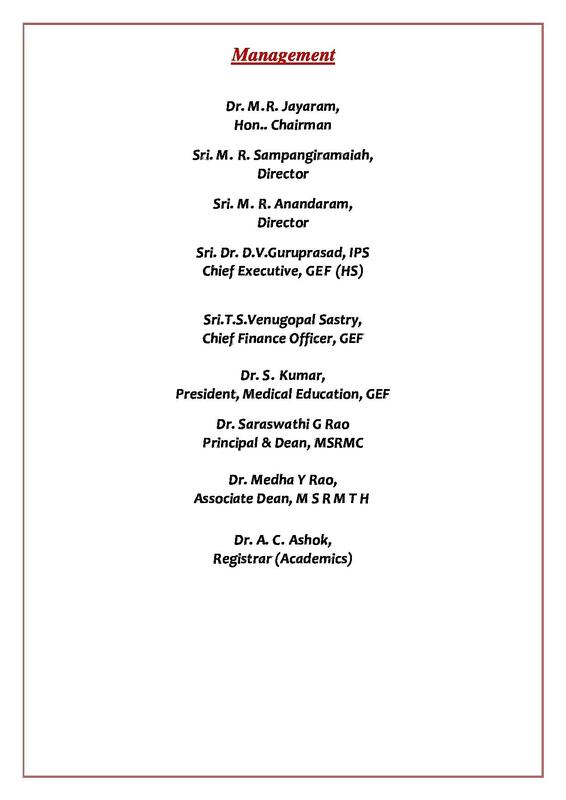 Hi Karthik, kindly contact the college on 080-23605190 , 23601742 , 23601743 , 23605408 to get the fee details of this course. My neet rank is above 10lakhs. Will i get admission for mbbs? Hi Shreya, its depends upon the merit list whether you will get admission or not according to your rank. 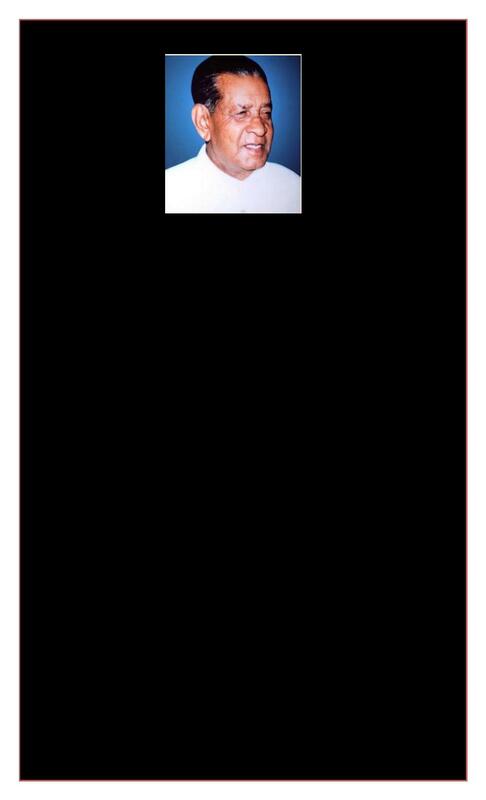 Hi Deepak, Please contact to this no. 080-23605190 , 23601742 for getting the Management information. Hin Doi, You may please contact 080-23605190 , 23601742 to get fee details according to the category. Do we have any management seats ? Does Neet score affect the selection through management quota? 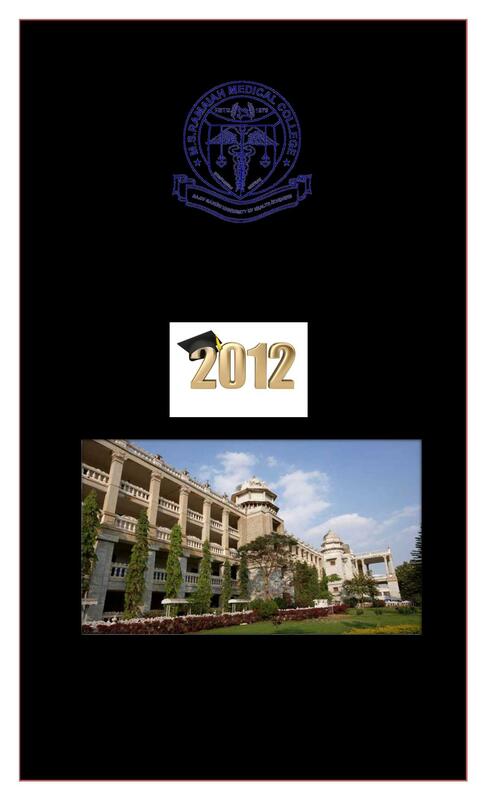 Hi Abhinav, To get information regarding the management seats you may contact to 080-23605190 , 23601742. Hi Raghu, Yes, You can apply for this college as your course, and as per your request I am sharing a link with you to get the full information about the Admission Procedure. I'm from Nepal, and how do I apply for MBBS? Hi Aishwarya, NEET Entrance Exam is compulsory for taking admission in MBBS. I would like to know the process of admission for my daughter to MBBS next Sep 2018. She is a Malaysian citizen holding the OCI card. She is doing her A levels now at KL.Please advice me on the fees and NEET / other entrance exams. Thank you.